In honor of Saint Valentine and his official day a mere six days away, we started thinking--what's the most romantic creature in the Chesapeake region? Is it the seahorse that dances and twirls with its mate, intertwining tails and changing colors as they spin? The jellyfish that, in pure Shakespearean tragedy, promptly dies right after spawning? We'd like to think it's the osprey. 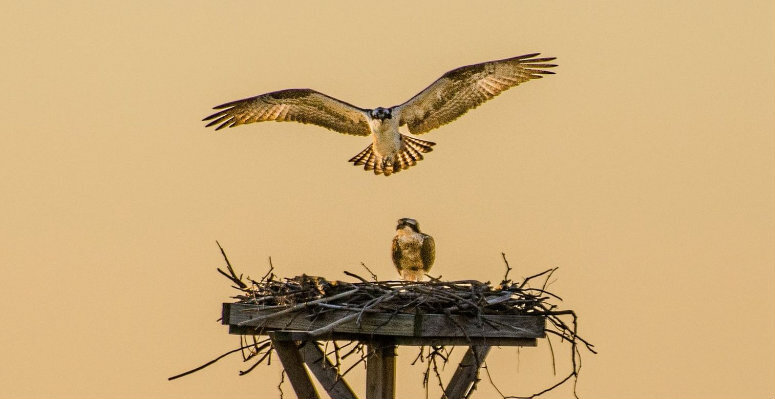 The osprey that mates for life and returns each year (often traveling thousands of miles) to nest in the same area where they were born and to be reunited with their one and only. As true with many relationships, ospreys develop a strong partnership as they build their "home" or nest together. As they continue to play house, females lay eggs, which they incubate for one to two months. The devoted parents stick together and feed and care for the nestlings for 40-55 days after hatching until they learn to fly. Very soon these osprey will begin their migration north for the spring and summer, many settling into nests in the Chesapeake Bay region--what's often called the "osprey garden" as it has the most concentrated population of osprey in the world. We can't wait to see these lovebirds again. An osprey returns to his mate.